In the world of lotions, sticks, creams and balms, SPF Addict offers a non- sticky, non-greasy alternative to daily sun protection – UPF 50+ sunscreen clothing. SPF Addict, manufacturer of high- quality, California-made sun protective clothing, is donating $ 2.00 of every purchase during the month of May to the Melanoma Research Foundation in honor of National Melanoma/Skin Cancer Awareness Month. As a registered nurse specializing in the cosmetic dermatology field, SPF Addict’s president and designer Marina Arnold, R.N. has treated countless patients, young and old, with sun-damaged skin. “I realized early in my career the importance of pro-active sun protection needs to go beyond the scope of just lotions. Sunscreen lotions serve only a small role in whole-body sun protection, protective clothing is another extremely valuable and effective tool in sun protection,” says Arnold, R.N. Manufactured with Tencel Sun® fabric made from eucalyptus wood; this fiber is extremely soft, durable, eco-friendly, biodegradable and ideal for sensitive skin. SPF Addicts fabrics are independently tested for a UPF rating of 50+, blocking 98% of harmful sun rays that can cause skin cancer and premature aging; even after 40 wet and chlorinated launderings. About SPF Addict – SPF Addict clothing for the family can be purchased at independent clothing retailers throughout the United States, online, and at boutiques worldwide. A family business, the company was founded in 2011 by Marina Arnold, R.N. who has over 30 years of medical practice experience; specializing in the cosmetic dermatology field. SPF Addict clothes are made in the U.S.A., utilizing organic “green” fibers, tested for UPF rating of 50+, and are approved by the Melanoma International Foundation. SPF Addict is located and manufactured in Orange County, California. For more information, contact the company at (877) 540-9733 or visit http://www.SPFAddict.com. For more information, samples or images, editorial media may contact Karen Beaudin at Karen(at)bullpenpress(dot)com. Leading London Aesthetic Physician, Dr Barbara Kubicka MD at ClinicBe, announces innovative skin treatments for dealing with summer skin problems, helping patients to look better and feel more confident in their appearance too. A second suggestion is to manage the natural problem of sweating, which some people find more difficult to manage than others. The condition of excessive sweating or hyperhidrosis affects a great many people, causing uncomfortable and visible levels of sweat, which can appear as damp patches on clothing and might even have an odour. Finally, Dr Kubicka suggests an innovative solution to the problem of hard, dry and cracked foot skin, which is uncomfortable as well as unsightly when exposed with bare feet. Taking the idea of handheld exfoliating devices a step further, Dr Kubicka offers a chemical peel to break down the outer layers of hard dead skin, kick-starting a peeling process which then encourages new skin cells to form. This treatment can be very helpful in recovering healthier skin for the feet. ClinicBe® is conveniently situated on the border of Belgravia/Knightsbridge and is popular with patients living or working in the West London area, including Chelsea, Kensington and Mayfair although patients also travel from across the UK and even overseas to visit Dr Kubicka. The clinic offers an extensive range of cosmetic, cosmetology and medical skin treatments. 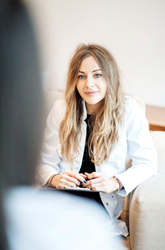 Dr Barbara Kubicka MD, CIME/ICAM, MBCAM leads the clinic as a fully qualified doctor, registered with the GMC and with additional qualifications in aesthetic treatments from the world-renowned College de International de Medicine Esthetique in Paris. She is renowned for her integrated, holistic approach to skin and healthcare as well as her innovative approach to skin treatments including her creation of a number of exclusive treatments. 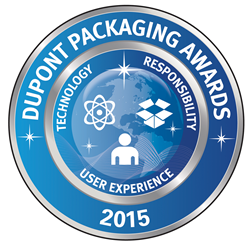 The 2015 DuPont Awards for Packaging Innovation will be remembered as the year of design as 77 percent of the winners are being honored for design excellence in enhancing the users’ experience. Canada-based IPL, Inc., earned the Diamond Award, the program’s highest honor, for SkinnyPack™ Technology. This mono-material package marries flexible and rigid packaging to create a thin, light, strong structure that uses less material, enables recycling and allows more message space. The DuPont Awards for Packaging Innovation is the industry’s longest-running, global, independently judged celebration of innovation and collaboration throughout the value chain. An independent panel of packaging experts evaluated nearly 140 entries from more than 25 countries and last night awarded one diamond winner, five gold winners and seven silver winners based on “excellence” in one, two or all three categories: technological advancement, responsible packaging and enhanced user experience. “The winners demonstrated the power of integrating precision engineering, design and technology in a way that brings multi-sensorial yet functional packaging to delight consumers,” according to Yasmin Siddiqi, DuPont Packaging Awards program leader. Click here for complete descriptions, list of collaborations and high-resolution images. IPL’s new hybrid container is allowing Ana’s Foods to be a standout on store shelves. Through collaboration with IPL, Ana’s Foods replaced its rigid salsa containers with the SkinnyPack™, a flexible-rigid container that combines the advantages of thin, flexible film (lightweight, flexible, and printable) and the advantages of a strong, rigid frame (sturdy, structural component). The SkinnyPack™, developed by IPL, is an injection molded polypropylene container that is made by fusing a thin, flexible in-mold label (IML) film to a sturdy, rigid frame. This process ensures that a strong adhesion exists between the film and injected plastic, allowing the packages to remain sturdy and strong throughout production, filling, transport, distribution and consumer use. The uniqueness of the SkinnyPack™ helps to differentiate itself on store shelves. The high-clarity film windows offer a look inside to give consumers confidence in the product prior to purchase. The in-mold labeling offers high-resolution graphics for high-impact shelf appeal. The round mouth gives consumers easy access to the product inside while the square edges of the bottom provide better grip and handling. The unique squround (square-round) shape of the container ensures distinction on store shelves while providing ease for food manufacturers to adopt the new package. The squround shape is compatible with most current packaging equipment, whether it is for square or round containers. In developing the SkinnyPack™, IPL and Ana’s Foods took existing technology to a whole new level. With the properties of both flexible and rigid packaging, the SkinnyPack™ highlights the world of possibilities that exists for packaging. An eye-opening innovation, AmorePacific’s squeezable mascara tube eliminates consumer frustrations with inconsistent delivery, dried out product and inability to extract mascara from the tube. This squeezable mascara tube is the first matte silicone mascara tube in the world. A hybrid package made of a silicone tube with an aluminum laminated inner pouch, the tube looks like a traditional mascara tube at first glance but surprises users with its enhanced features that address known market needs for functionality and consistent dosing. With traditional mascara tubes, the high viscosity mascara tends to accumulate along the inner wall, becoming unreachable or dried out. The squeezable mascara tube allows users to soften, reposition the remaining mascara, and transfer the mascara to the applicator with just a light squeeze of the tube. This enables a consistent amount of mascara to be delivered every time so that users will get the same great experience with each application. The enhanced functionalities of the squeezable mascara tube help to dramatically reduce the amount of unusable mascara remaining in the tube and extend the useful life of the mascara, while providing a unique tactile sensation. The Axe and Lynx aerosol cans showcase an outstanding balance of technology and enhanced consumer experience. Every component of the deodorant can is specially designed to play a specific role in maximizing the consumer experience, reducing impact on the supply chain and maximizing efficiencies. The vibrant aluminum cans feature a squround (half square, half round) shape to deliver a unique look while accommodating the industry standard 1 inch valve. The square body rotates to reveal the valve and trigger button, allowing consumers to experience the same twist-open action of the previous cans. As the body rotates, the button emerges from the flat top and tilts to provide a pleasing opening experience. To eliminate leakage or accidental activation, the spray channel is designed to engage with the valve only when in the open position. When the valve is closed, the spray channel separates from the valve completely. The button, designed using insights gathered from consumer studies, activates regardless of how the consumer holds the can or where they press on the button. With this aerosol can, Unilever took precise, high-level engineering and delivered it to the Axe/Lynx consumers in a sleek, yet sophisticated way that differentiates it from competition. Need a blast of mouthwash? Wish you could fit a bottle of hand sanitizer in your designer jeans? MiiSTS™ ultra slim sprays makes it possible to easily carry premium everyday essentials for when you need them most. Helping to bring “Your Personal Care Anywhere,” MiiSTS™ bottles are establishing a new standard for convenience packaging. MiiSTS™ is the only flat travel-size bottle in the market. The ultimate in portability and convenience, the MiiSTS ™ bottle is the rough dimensions of a credit card and just 5mm thick at its thinnest point. MiiSTS™ is fitted with a pump housing that allows consumers to spray the product while keeping the package leak-proof. The precise engineering of the tight welds on the very thin corners of the injection-molded, polypropylene bottle gives a smooth, virtually seamless, appealing finish. The sleek and modern MiiSTS™ discreetly fits in tight pockets and bags with virtually no bulge. Each MiiSTS™ contains approximately 11mls (about 150 sprays) of the MiiSTS™ product, including natural hand sanitizer, natural insect repellent, sunscreen spray, lens cleaner, stain remover, burn and bite relief and more. As demand for convenience increases, manufacturers must develop packaging solutions that provide both easy opening and restricted access as needed. With over 20 years of experience producing child-resistant flexible pouches, Pactech Packaging partnered with Presto Products to develop a slider-based closure that has passed the testing requirements set forth in Title 16 CFR 1700 of the Poison Prevention Packaging Act (PPPA). This new technology will allow products that had been previously packaged in child-resistant boxes or bulky plastic containers to be packaged in flexible packaging. Produced in a variety of sizes from 8.5” x 5” to 13.5” x 18” with and without a standup gusset, the size of the package is scalable to the size desired by the end user. This allows end users to keep a consistent look to their package while sizing it right for their products. Medi-CRREO™ Child Resistant Pouch offers increased graphic billboarding that cannot be seen on prescription bottles or rigid blister packaging. The Medi-CRREO™ with Child Guard™ closure also uses a high strength barrier material that is bite and tear proof. Markets for the Medi-CRREO™ with Child Guard™ closure include food and consumer products as well as prescription medication, agricultural products and household chemical products. Previous packages for TAVI catheter devices required significant hospital preparation and resources in preparing the catheters for use. The new EnVeo™ R Packaging is designed with added functionality that helps streamline the valve preparation and loading process before surgery. The innovative tray provides a single user complete control and additional functionality during the preparation and loading of the valve onto the catheter. A reflective film strip is located within the integrated loading bath of the tray, giving the nurse a 360 degree visualization of the valve and all the attachment points to provide confidence and comfort of precise valve loading on the catheter. A unique swivel feature in the tray design, along with locking features, allows the tray to be in a straight configuration during transportation, then manipulated through the swivel feature into a u-shaped configuration during valve loading in the surgery preparation. With the new tray, aspects of the loading process are streamlined to reduce the burden on the operator, while still maintaining the tray’s primary role to contain the catheter in a sterile environment and deliver it securely to the end user. The tray helps reduce the labor needed for catheter preparation at hospitals by 50 percent. No longer seen as packaging waste, the EnVeo™ R package has become an essential part of the surgical team. Over 842,000 people in the world die annually from dehydration causes. About 750 million people worldwide lack access to clean water. Mix Pak System’s Oral-Rehydration-Salt (ORS) package addresses these needs to put life-saving treatment into the hands of the people who need it. Mix Pak System, S.L. collaborated with Interapothek to develop a new product for its comprehensive pharmaceutical portfolio, an oral rehydration salt (ORS) serum. The ORS package is a dual chamber pouch, with one compartment containing a precise dose of powder supplements and the other containing fresh water. The two chambers are separated by a frangible seal, made with DuPont™ Surlyn® resin, which can be opened by applying pressure on the water compartment. Once the seal is opened, both ingredients mix and the ORS is ready to be consumed. The separation of the ingredients eliminates the need for refrigeration and increases the shelf life of the product to two years (mixed ORS packages have a shelf life of hours). This very simple packaging solution brings life-saving treatment to people in areas with no electricity, infrastructure or drinkable water. The new BelGioioso Mild Provolone package raises the bar for resealable packaging at the club store level. Made up of two individually-sealed compartments, this transformational package provides consumer convenience by allowing the user to easily peel and reseal the package 20 times or more with fingertip pressure. What’s more, the perforation between the two compartments allows the consumer to easily separate without using a knife or scissors. Bemis’ SmartTack™ EZ Peel® Reseal™ technology allows the individual cheese compartments to be sealed separately, preserving the freshness of the unused portion until opening and reducing food waste – all while creating differentiation at the club store level for BelGioioso Cheese. The multi-dimensional graphics and eye-catching design of the Gillette® Venus® Swirl™ package give consumers a multi-sensory experience right at the store shelves. Printed with think4D technology, the thermoformed lid features a multi-dimensional silver ball printed and formed in precise detail to showcase the new FLEXIBALL™ design of the Venus® Swirl™ razor. The arched bottom tray reflects the razor’s own curves. Typically, sealing to an arched surface is challenging and results in high scrap rates. This challenge was solved by using think4D’s pack-out system in which the multi-dimensional lids are packed hot right off the thermoforming line. The residual heat enables the lids to maintain the desired arc and lie nicely on top of the arched trays, minimizing spoilage and maximizing automation efficiencies during the heat-sealing process. With this package, Gillette and think4D take thermoforming of a printed substrate to a whole new level. Parcel and freight shipping are now more sustainable with the introduction of the Kübox easy crating system. This paper-based crate fills the need when customers want something lighter, less expensive and easier to use than the traditional wooden crates or plastic cases, but a corrugated box is not enough. With half the weight of a wood crate and compression strength of over 5,000 pounds, the Kübox is both very light and very strong. Through innovative design, the Kübox can be easily and safely assembled/disassembled without tools and can be shipped/stored flat, saving on space, labor, and transportation costs. The strength and durability of the Kübox ensure that the contents, from gallery artwork to aircraft engines, stay safe throughout delivery. After delivery, the Kübox can be reused in a variety of ways, most often as furniture and storage by consumers and for repetitive, out and back shipments by businesses. Godrej partnered with BBLUNT, a premium Indian salon chain, on the development of their first hair care product line. BBLUNT conditioners have high viscosity which provides superior product performance, but are difficult to dispense from bottles made of regular polymers. Therefore, polyethylene copolymer with the lowest modulus was chosen for the bottles to provide great squeezability even at high wall thickness. However, the polyethylene copolymer made the surface dull and prone to scratching. Godrej found that a thin layer of DuPont™ Surlyn® resin delivers superior surface gloss, scratch resistance and a rich feel. Processing the two polymers without a tie layer was a challenge as the difference in material rheology caused variations in wall thickness, parison sagging and improper blowing. Extensive trials were conducted with Classy Kontainers to stabilize the process and get consistent output. The BBLUNT conditioner bottle conveys the essence of the premium BBLUNT brand through its bold shape and shine. Single-use lipstick sampling completely changes the lipstick sampling experience in Brazil. Makeup testing can be an unsanitary experience for consumers. The shared sampling pots in stores may become a breeding ground for bacteria and germs that can cause minor to serious skin problems or infections. To solve this issue, Grupo Boticario developed a new way to test lipstick that provides a simple, engaging, and sanitary experience for customers. The sampling lipstick is a single dose of lipstick “printed” on coated cardboard through a process similar to graphic printing. To test, the consumer simply removes the plastic film, folds the cardboard in half and applies the lipstick directly to the lips, without needing to use fingers to spread the lipstick on. Each sampling lipstick is used once and then disposed. This simple, easy-to-use sampling solution offers consumers in Brazil a realistic preview of the lipstick color and texture and gives them confidence to purchase the product. The cement industry in India is the fourth largest in the world, but more than 3 percent of the cement produced is lost in the supply chain. This loss is largely attributed to the cement bags being stored in open environments across the supply chain, making them vulnerable to damages caused due to exposure of cement bags to rain, unpredictable outdoor conditions and extreme climate. The Flex SafePack is specially designed to provide a barrier to moisture and water from entering into the bag, helping the cement withstand harsh environments and maintain its full functionality over an extended period of shelf life. In developing the SafePack, UFLEX had to address two conflicting requirements: providing de-airation holes required for air to escape during filling and prohibiting moisture from entering into the bags during transportation. UFLEX was able to achieve this challenge through optimized nano-embossing over a flexible extrusion layer. This technological achievement also allows high definition graphics of up to 10 color printing, giving a premium look to a commodity product. DuPont Packaging & Industrial Polymers manufactures an extensive mix of adhesive, peelable lidding and sealant resins and provides a globally networked development team to work with customers on packaging programs that help protect the product, environment, improve shelf appeal, convenience and reduce cost in the food, cosmetics, medical products and other consumer goods and industrial packaging industries. The DuPont Oval Logo, DuPont™, and Surlyn® are registered trademarks or trademarks of DuPont or its affiliates. SkinnyPack™ is a trademark of IPL, Inc.
MiiSTS™ is a trademark of MiiSTS Int’l. Inc.
Medi-CRREO™ with Child Guard™ are trademarks of Pactech Packaging; Reynolds Presto Products. SmartTack™,EZ Peel® and Reseal™ are trademarks or registered trademarks of Bemis Company, Inc.
Gillette®, Venus®, Swirl™ and FLEXIBALL™ are registered trademarks or trademarks of The Gillette Company. EnVeo™ is a trademark of Medtronic CardioVascular. An expert group of dermatologic surgeons appointed by the American Society for Dermatologic Surgery (ASDS) Board of Directors has developed the first-ever consensus recommendations on the treatment and management of basal cell carcinoma (BCC), the most frequently occurring form of skin cancer. The procedural analysis, which also compares the effectiveness and costs of various treatment methods, is featured in the May 2015 issue of the Dermatology Surgery journal. The document is intended to provide physicians with a set of clinical principles and courses of action for BCC management based on evidence from a comprehensive literature review and the evaluation of treatment methods – taking into consideration cure rates, recurrence rates, aesthetic and functional outcomes, and cost effectiveness. BCC is the most common cancer in the U.S., with nearly 3 million new cases each year. The top risk factor is exposure to UVA or UVB rays – whether from sunlight, tanning booths or UV light therapy. While BCCs rarely metastasize, left untreated they can cause localized tissue destruction, cosmetic deformities and functional disabilities. According to the ASDS authors, the ultimate treatment goal for BCCs is complete tumor eradication. As such, they agree surgical approaches provide the best outcomes. Individual treatments vary according to the cancer size, depth, location and other relevant medical history. Of significance, the authors regard Mohs Micrographic Surgery as an efficient and cost-effective procedure that remains the treatment of choice for high-risk BCCs and for those in cosmetically sensitive locations. They note that non-surgical modalities may be used for low-risk BCCs when surgery is contraindicated or impractical, but the cure rates are lower. In addition to Mohs surgery – which offers complete tumor margin analysis – the authors describe other well-established surgical methods. Caveats are added that standard surgical excision with post-operative pathological examination is usually done with incomplete margin assessment, and intra-operative frozen section margin sampling is frequently incomplete. According to the data presented, Mohs surgery and surgical excision remain the most effective modalities to treat BCCs. Alternative BCC treatment approaches also are discussed, including curettage alone or followed by electrodesiccation, radiation therapy, cryosurgery, photodynamic therapy and topical medications. For each modality, the authors systematically review the advantages, disadvantages and associated adverse events. A cost analysis of the treatment methods shows the outlays for Mohs and surgical excision as well as some non-surgical treatments are comparable, and that radiation therapy, which is less effective, is more expensive. Mohs remains the “most cost-effective method” when other factors are taken into account, including recurrence rates, destructive modalities and the fees associated with the office-based procedure versus ambulatory surgical centers or hospitals. The authors also recommend that patients with a single suspicious lesion undergo a complete skin examination by a qualified physician because they often have additional cancers or pre-cancers at other sites and also are at an increased risk for developing malignant melanoma. Incidence and patterns – Although BCC occurs in all skin types and races, it is most likely to develop in light-skinned individuals. Most BCCs occur on the face. The BCC incidence rate continues to rise, doubling every 25 years. Increasing incidence rates also are occurring in those under 40 and in women. While only 15 percent of BCCs occur in patients under 35, aggressive subtypes occur more often in this age group. Causes – Chronic sun exposure is the most common risk factor for the development of BCC, with a typical latency period of 15 to 20 years between the time of UV damage and clinical onset. Clinical features – Although there are many clinical variants, the most commonly recognized types are nodular, superficial and morpheaform BCC. The authors agree that identifying the histopathologic subtype is important because some subtypes behave more aggressively and are likely to recur if not completely eradicated. Authors of “Consensus for Nonmelanoma Skin Cancer Treatment: Basal Cell Carcinoma, Including a Cost Analysis of Treatment Methods” include: Arielle N.B. Kauvar, MD; Terrence A. Cronin Jr., MD; Randall K. Roenigk, MD; George J. Hruza, MD; and Richard G. Bennett, MD. 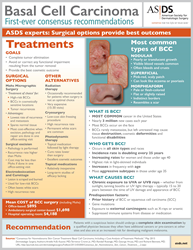 The BCC analysis will be followed in 2015 with similar recommendations for squamous cell carcinoma (SCC). The American Society for Dermatologic Surgery is the largest specialty organization exclusively representing dermatologic surgeons who have unique training and experience to treat the health, function and beauty of your skin. ASDS members are pioneers in the field. Many are involved in the clinical studies that bring popular treatments to revitalize skin and fill and diminish wrinkles to the forefront. Their work has helped create and enhance many of the devices that remove blemishes, hair and fat, and tighten skin. Dermatologic surgeons also are experts in skin cancer prevention, detection and treatment. As the incidence of skin cancer rises, dermatologic surgeons are committed to taking steps to minimize the life-threatening effects of this disease. For more information, visit asds.net. The National Association of Professional Women (NAPW) honors Janet Hunzinger, as a 2015-2016 inductee into the NAPW VIP Woman of the Year Circle. She is recognized with this prestigious distinction for leadership in healthcare. With more than 700,000 members and over 200 operating Local Chapters, NAPW is the nation’s leading networking organization exclusively for professional women. Ms. Hunzinger’s career as a Proven Process Improvement Professional with experience in the healthcare, insurance, manufacturing and distribution industries spans more than 20 years. She is a certified Lean Six Sigma Black Belt and a board member of Our Children’s Homestead (a licensed IL foster care and adoption agency). Prior to transitioning to the healthcare and service industries, she worked as an industrial engineer for leaders of industry including Dial Corporation, Avon Cosmetics and Borg Warner. “I work at the largest customer-owned health insurance company in the US,” says Ms. Hunzinger, Process Improvement Manager I at Healthcare Service Corporation (HCSC). HCSC offers a wide variety of health and life insurance products and related services through its operating divisions and subsidiaries, including Blue Cross and Blue Shield of Illinois, Blue Cross and Blue Shield of Montana, Blue Cross and Blue Shield of New Mexico, Blue Cross and Blue Shield of Oklahoma, Blue Cross and Blue Shield of Texas and Dearborn National. In 1999, Ms. Hunzinger began working in the healthcare industry as Front Desk / Sales Associate at Good Samaritan Health & Wellness Center in Downers Grove, IL, where she worked for seven years. She then joined Advocate Healthcare as a Senior Operations Improvement Consultant. There, she served as the support-center-based site champion for operations improvement, where she led the value stream activities at two large medical group practices, defining the direction of the lean activities with site leadership and determining the metrics for each activity. Ms. Hunzinger’s next position was a Process Redesign Analyst for Elmhurst Memorial Healthcare, where she worked with multiple patient care process teams and supported the move to a newly constructed replacement hospital before taking on her current role at HCSC. Leading organic skincare brand, Born Skincare, is expanding its acclaimed all-natural collection. The company will be introducing six new products when it attends Beautyworld Middle East in Dubai, UAE from May 26th to May 28th. The new products will include two varieties of body butters, a face moisturizer, an eye cream, a serum and a facial exfoliator. Unveiling these new products at Beautyworld marks the company’s first push into international sales. “We are very excited to attend Beautyworld Dubai and expand our business internationally,” says Born Skincare creator Gloria Barghi. Beautyworld is the largest international trade fair for beauty, hair, fragrance and well-being cosmetics. In addition to the latest product launch, Born Skincare recently released a foaming cleanser for men and women called Pure. Pure is a gentle cleanser that thoroughly washes away pollutants without irritating the skin. Although it is non-irritating, it is effective enough to take off makeup. It can also be used morning or night. 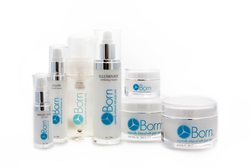 Born Skincare, offers a full range of products that embody the founder’s dedication to a toxic-free lifestyle. Buyers, sellers, and distributors who are interested in learning more about Born Skincare’s products should contact the company through the website. Born Skincare is a family-driven business that has a deep conviction in what it does, which makes its creators proud to put their names on every Born Skincare product. Born Skincare’s philosophy is that being healthy is paramount, and that being healthy begins with consuming the right foods and nourishing the skin. The company has devoted years of research towards maximizing the health and beauty benefits the grape provides. The results of this tireless commitment are in every bottle of Born products produced. For more information, visit bornskincare.com, Twitter @BornSkincare, Facebook, Pinterest at pinterest.com/BornSkincare/ and Instagram @BornSkincare. The Thinnovation Level 1 hands-on course included hands-on training on how to be a more confident cosmetic dentist and deliver naturally beautiful smiles with “Lumineers” while preserving the most tooth structure possible. Like porcelain veneers, Cerinate Lumineers are porcelain “shells” that we adhere to the front of a patient’s teeth to repair their teeth and enhance their smile. Completion of this course has allowed Dr. Wei to become a more confident restorative and cosmetic dentist and deliver beautiful smiles. Completing this cosmetic dentistry program and receiving the award and certificate has raised Dr. Wei to a higher-level as one of New York City’s top cosmetic dentists. For more information about the cosmetic and restorative dentistry services offered by Dr. Michael J. Wei or to schedule your complimentary consultation, call (212) 982-4080. Despite a glut of surgical lasers on the market today, the Quanta Aesthetic Laser is fast emerging as an industry leader, while transforming aesthetics. 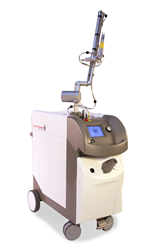 The multipurpose laser is being hailed as the “latest and greatest” as it is capable of tattoo, vein, pigment and hair removal, and Dr. Javaheri in San Francisco is at the forefront of this laser-removal revolution due to its use of the innovative laser. Dr. Shahin Javaheri is located at 2100 Webster Street, suite 502, San Francisco, CA 94115. For more information, please call (415) 923-3800. Dr. Javaheri is an expert in the field of Plastic Surgery who combines innovative surgical expertise with an artistic approach to achieving beautiful, natural and youthful looking results. He offers a full range of reconstructive and Plastic Surgery options that are performed in accredited, state-of-the-art plastic surgery centers. ICTV Brands, Inc. (OTCQX: ICTV), (CSE: ITV), a direct response marketing and branding company focused on the health, wellness and beauty sector, today reported financial results for the three months ended March 31, 2015. Launched media campaigns for five new products, resulting in incremental revenue of $ 232,000. Sellout on The Shopping Channel Canada as DermaWand returns to live televised home shopping for the first time in 2 years. $ 1.8 million in International third party distributor sales, an increase of $ 846,000 year over year. Adjusted EBIDTA loss of $ 94,000, including up front expenditures for five new campaign launches. Current working capital of $ 1.9 million. During the first quarter of 2015, we allocated considerable resources to our portfolio of brands still in a rollout phase, and as a result, we made a strategic decision to reduce the amount of airings of our DermaWand infomercial. Media expenditures were approximately $ 3.2 million and $ 3.9 million for the three months ended March 31, 2015 and 2014, respectively. Accordingly, our net sales decreased to approximately $ 8.9 million for the three months ended March 31, 2015, from approximately $ 9.8 million recorded during the three months ended March 31, 2014. Further, due to the reduced media spend, sales related to the DermaVital skin care line during the three months ended March 31, 2015 were approximately $ 822,000 compared to $ 1.2 million during the three months ended March 31, 2014. The Company resumed airings on live televised home shopping in the first quarter of 2015 which resulted in an increase of $ 49,000 to the revenue for the three months ended March 31, 2015, compared to no live televised home shopping sales in the prior year. The Company expects to continue airings on live televised home shopping throughout the remainder of 2015. Additionally, international third party distributor sales were approximately $ 1.8 million during the three months ended March 31, 2015, as compared to approximately $ 956,000 during the three months ended March 31, 2014. Gross profit percentage was approximately 70% for the three months ended March 31, 2015, compared to approximately 74% during the three months in 2014. For the three months ended March 31, 2015 we generated approximately $ 6.2 million in gross profit, compared to approximately $ 7.2 million for the three months ended March 31, 2014. The decrease in gross profit percentage is a result of a higher percentage of international sales compared to DRTV sales, due to international sales having a lower gross profit. Total operating expenses decreased to approximately $ 6.5 million from approximately $ 7.7 million as a result of the decrease in media spend and volume. Despite the volume related decreases, the Company had a number of significant one time expenditures in Q1, specifically approximately $ 84,000 in print media costs related to the Company’s retail strategy for DermaWand as well as approximately $ 50,000 in radio media expenses for CoralActives. Furthermore, the Company had a number of expenditures for products in the early stages of their life cycle as the Company tested new creative and media outlets. For products with continuity programs, a significant portion of its profits are during the second continuity sale after the initial customer acquisition. The Company’s new products, including CoralActives, Derma Brilliance, elastin-rp, Juvion, and Good Planet Super Solution, contributed net revenue of approximately $ 223,000, gross profit of approximately $ 145,000 and total operating expenses of approximately $ 415,000. The Company generated a net loss of approximately $ 270,000 for the three months ended March 31, 2015, compared with a net loss of approximately $ 515,000 for the three months ended March 31, 2014. Net loss per share was approximately ($ 0.01) compared to net loss per share of approximately ($ 0.02). Included in the net loss is non-cash share based compensation of approximately $ 162,000 and the investment mentioned above in our new products. Adjusted EBITDA loss was approximately $ 94,000 compared to adjusted EBITDA loss of approximately $ 304,000 in the prior year quarter. As of March 31, 2015 and December 31, 2014, the Company had $ 1.1 million in cash and cash equivalents and working capital of $ 1.9 million, which demonstrates our strong liquidity and continued investment in the growth of ICTV. Additionally, the Company had no debt obligations at both March 31, 2015 and December 31, 2014. ICTV will hold a conference call to discuss the Company’s first quarter 2015 results and answer questions today, May 7, 2015, beginning at 4:30pm EDT. The call will be open to the public and will have a corporate update presented by ICTV’s Chairman and Chief Executive Officer, Kelvin Claney, President, Richard Ransom and Chief Financial Officer, Ryan LeBon, followed by a question and answer period. The live conference call can be accessed by dialing (866) 952-1906 or (785) 424-1825. Participants should ask for the ICTV Brands Earnings Conference Call. Participants are recommended to dial-in approximately 10 minutes prior to the start of the event. A replay of the call will be available approximately two hours after completion through May 21, 2015. To listen to the replay, dial (800) 753-5575 (domestic) or (402) 220-0683 (international). The conference call transcript will be posted to the Company’s corporate website (http://www.ictvbrands.com) for those who are unable to attend the live call. ICTV Brands, Inc. sells various health, wellness and beauty products through a multi-channel distribution strategy. ICTV utilizes a distinctive marketing strategy and multi-channel distribution model to develop, market and sell products through direct response television (DRTV), Internet/digital, e-commerce, live television shopping and retail. Its products are primarily sold in the U.S. and available in over 60 countries. Its products include DermaWand, a skin care device that reduces the appearance of fine lines and wrinkles, and helps improves skin tone and texture; DermaVital, a professional quality skin care range that effects superior hydration; Jidue, a facial massager which helps alleviate stress; Derma Brilliance, a cosmetic skin resurfacing system; and CoralActives, a line of acne treatment and skin cleansing products. ICTV Brands, Inc. was founded in 2002 and headquartered in Wayne, Pennsylvania. Adjusted EBITDA is defined as income from continuing operations before depreciation, amortization, interest expense, interest income, and stock-based compensation. Adjusted EBITDA is not intended to replace operating income, net income, cash flow or other measures of financial performance reported in accordance with generally accepted accounting principles. Rather, Adjusted EBITDA is an important measure used by management to assess the operating performance of the Company. Adjusted EBITDA as defined here may not be comparable to similarly titled measures reported by other companies due to differences in accounting policies. Forward-Looking Statements. This press release contains “forward-looking statements” within the meaning of Section 27A of the Securities Act of 1933, as amended, and Section 21E of the Securities Exchange Act of 1934, as amended (the “Exchange Act”) (which Sections were adopted as part of the Private Securities Litigation Reform Act of 1995). Statements preceded by, followed by or that otherwise include the words “believe,” “anticipate,” “estimate,” “expect,” “intend,” “plan,” “project,” “prospects,” “outlook,” and similar words or expressions, or future or conditional verbs such as “will,” “should,” “would,” “may,” and “could” are generally forward-looking in nature and not historical facts. These forward-looking statements involve known and unknown risks, uncertainties and other factors which may cause the Company’s actual results, performance or achievements to be materially different from any anticipated results, performance or achievements. The Company disclaims any intention to, and undertakes no obligation to, revise any forward-looking statements, whether as a result of new information, a future event, or otherwise. For additional risks and uncertainties that could impact the Company’s forward-looking statements, please see the Company’s Annual Report on Form 10-K for the year ended December 31, 2014, including but not limited to the discussion under “Risk Factors” therein, which the Company has filed with the SEC and which may be viewed at http://www.sec.gov. Amber Dreadon, one of the fashion and music industry’s most sought-after makeup artists has partnered with luxury beauty brands BABOR and Sisley to create a soft, glowing new beauty look for Grammy Award-winning artist LORDE at last night’s Metropolitan Museum of Art Costume Institute Benefit. For the exclusive, star-studded Met Gala Amber will be using a selection of luxury skincare and makeup products from both iconic brands for LORDE’s Red Carpet look. “We were inspired by the shades of the Calvin Klein gown she is wearing and the texture of the sequins – how they look in the light and dark and wanted to recreate that on the eye. Keeping that as the focus,” Amber said. EDITOR’S NOTE: To arrange an interview with Ms. Dreadon please let us know, as space is extremely limited.